Use your target from January to get your pet to voluntarily step on to scales – this could be at your local vet or simulated at home. Teach your pet to expose their belly for exam. For dogs and cats this is most likely easiest in a roll over, in birds etc, perching and remaining still for abdominal exam. Teach your pet to hold still using a target (chin/hand/chair etc) for a period of 10 seconds. Start building up to add body examination. Teach your dog or cat to wear a muzzle (Baskerville-ultra preferred for dogs). Towel wrap for rodents, birds etc. This must be a game and the animal must choose to participate and move toward the muzzle or towel. Building on from Mays challenge. Now run hands over animal whilst maintaining target from nose to tail. It is important it is a game of consent. If the animal breaks the target, stop the exam. Teach your pet a reliable look at me (eye contact for 5 seconds) and examine eyes with a low level brightness of torch. Teach your pet to perform a sustained target that allows you to examine teeth, administer eye drop or ear drops, or restrain for blood taking or fake vaccination. Teach your pet to offer front feet for nail board and scratch for filing themselves. Teach your pet to nail board hind feet. 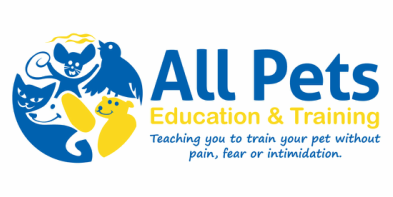 Post your video to All Pets Education and Training Facebook page (either direct or via YouTube). All tasks must be trained using reward based methods. Consider your pet’s safety – if they are not suitable for a task adjust it so that it suits them.